Being gluten-free doesn't have to be a drudgery, especially when it comes to the most important meal of the day. Studies have shown that children who eat a healthy and balanced breakfast do better in school. Kids need lots of energy to help them concentrate on their studies rather than their stomachs. These kid-friendly gluten-free breakfast recipes supply protein, complex carbs, fiber, and good fats with foods that provide sustainable energy for growing kids on gluten-free diets. © 2010 Teri Lee Gruss, licensed to About.com, Inc. 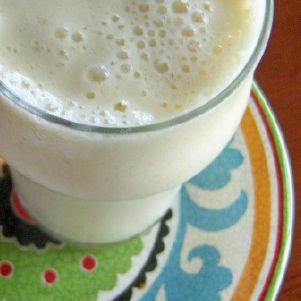 Kids will love this creamy, delicious high protein "banilla" smoothie. It combines banana and vanilla into a tasty treat. There's a lot of nutritional value in this five-minute busy morning gluten and a dairy-free smoothie. Use a frozen banana for an extra creamy texture. What makes morning glory muffins so special? Along with their sunny flavor, they are literally loaded with fruit and vegetables. What a fun way to get your kids to eat produce for breakfast! This is another recipe where you can swap out fruit and nuts to meet your child's preferred flavor profile. These muffins are so good you'll probably want to swipe one on your way into the office. On those especially hectic mornings, it's good to have homemade gluten-free energy bars on hand. They're an easy, no-bake, nutritious, and economical alternative to commercial energy bars. Best of all, you can substitute your favorite dried fruits, nut butter, nuts, seeds, and sweeteners to create your own personalized energy bar. These kinds of DIY recipes help you easily monitor your child's diet. Being gluten-free doesn't mean you have to skip breakfast carbs altogether. These gluten-free pancakes are loaded with blueberries, so you get an antioxidant boost first thing in the morning. They're also packed with flavor! You can swap the blueberries for any other fruit you desire. This is a fantastic make-ahead gluten-free breakfast recipe. It's extraordinarily delicious and quick to make. These waffles are another example of why being gluten-free doesn't have to mean skipping out on beloved breakfast staples like waffles. While most egg dishes make for good gluten-free breakfasts, poached eggs are fast, easy and delicious when served on a slice of gluten-free toast. The secret to this perfect poached eggs recipe is using the freshest eggs you can find. Eggs are full of protein which will help keep your children feeling full until the lunch bell rings.